with (G - US$45) or without (F - US$35) crocodile teeth. 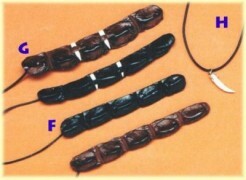 Crocodile tooth necklace (H - US$35) is with a silver cap on an adjustable cotton string. 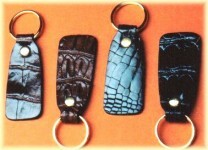 Saltwater crocodile tail tip key chains - exotic small gifts from Outback. 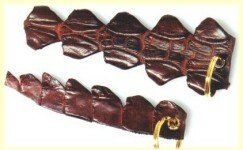 Saltwater crocodile crown (Hornback) key chains are available in black and brown. Key tags with one side crocodile leather. Available colors black and brown. 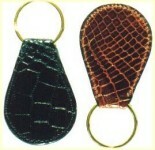 Key fobs - both sides crocodile leather. Crocodile leather covered executive pens with gold plated fittings. Supplied in a nice gift box. Available only in black glazed crocodile leather. Crocodile leather cigarette lighter cover - cool little gift for people who value fine things. It fits standard size cigarette lighter. Crocodile leather covered letter opener. The best belt a man can get. For detailed description and width/size/price table, please click on belt picture.